Many times networkers are faced with requirement of Static Public IP Address like when provisioning a Web Server, a labwith access over Internet or even when setting up an email server. In such scenarios, either a new Internet package needs to be bought which includes public IP addresses or else we buy new Static Public Address pool from provider. However, starting cisco IOS 12.4 onwards, a protocol called DDNS (Dynamic DNS) can be configured on Cisco Routers which allows to update the DNS entry when the Router IP address changes – Hence Static IP address requirement is mitigated. An account needs to be created for registration with DDNS provider. Configure Cisco Internet Router to act as a DDNS client.DDNS provider creates a unique domain name, pointing to the current dynamic IP address on Cisco Internet Router. When Internet Router reboots or Dynamic IP address changes, it receives a new IP address from ISP. The DDNS clientnotifies the DDNS server and DNS record is updated with the new Public IP address. When Internet User wants to access “test.dyndns.org”, it sends the DNS query. 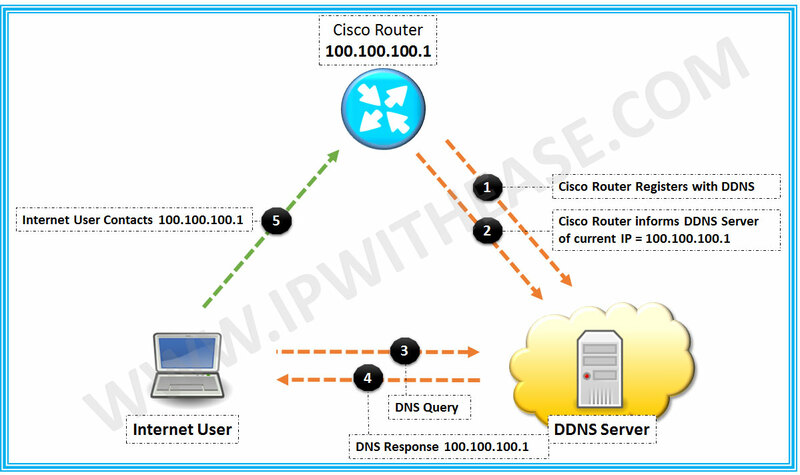 DDNS repsonds to DNS query by providing the IP address 100.100.100.1 of Internet Router. Once User receives the Dynamic Public IP of Internet Router (100.100.100.1), user ca communicate with Internet Router through its newly assigned IP address. In this scenario we will use HTTP as update method under configuration,to specify the URL the router will use to contact the DDNS provider with a new Public Dynamic IP address when a change occurs. Next up, we set the update interval to ensure the FQDN is updated as frequently as possible. The interval settings configuration updates to 1 Day, 0 Hours, 0 Minutes and 0 Seconds.